I have mentioned before, that in my family the Christmas tree is revealed on the 24th of December, this way it can be fully enjoyed during the twelve days of Christmas. Some people have the tradition to take it down on Epiphany after letting all the candles burn to the end, others, according to wikipedia, wait until the beginning of February to take down the tree. On the 22nd or so, I saw someone put their Christmas tree into a tree bag outside of their house for pickup, a bit too early, and I have seen quite a few trees collected in the nearby park yesterday (some years as early as the morning of the 25th you can find out chucked out trees…). If we would do that, then we’d have either no tree at all, or get rid of it after too little time. 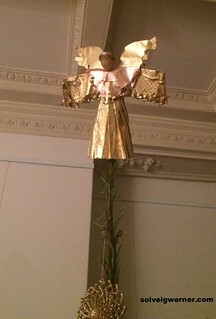 This angel sits atop the tree. If I recall correctly he was a present my paternal grandmother made for my parents. Over the years his face made from wax has lost it’s contours. When I was little, he was holding candles in his hands, but they melted with the heat from tree’s candles below.